Well that was a great little Prog. Beginnings, endings, and one offs. A nice little balancing act there. Anyway under another wonderful Ezquerra cover we have a really fun one off Dredd. I'm really enjoying Rory McConville's work and his Dredd is great. This is a really fun light throw away gag done really y well and I've said all that needs to be said before about how great Dan Cornwell is and he's just getting better. Skip Tracer is such a proficient openner. Peatty and Marshal, set up our over crowded dystopian world and we don't have time to worry about the fact that it might be a little cliche before we have some blistering action and a nice bit of intrigue at the end to pull us back for more. 5 pages used very professionally and I'm optimistic this one could go places. Deadworld likewise neaty sets the scene, clearly recaps without reallyfeeling too recappy and then set up our challenge which is one that has me very excited. Great return... christ to think I didn't used to get on with the strip. The last few stories have really cemented this one as a fav. Finally Strontium Dog ends what's been a very interesting story which got better and better... until... well if I'm honest it kinda fumbled the ending a little, as if Wagner wasn't quite sure how to draw a neat line under it. Still fun episode and really looking forward to this one coming back. So that's been a great run of stories, segwaying into some good looking new stuff with the promise of other good stuff and Survival Geeks next week and made all the sweeter with an advert for KIngmaker's return. That robot they decided to go after last week steals the show with his antics and one-liners, and he's a strong enough character to have been the main bad guy for a whole ten episode series, but Wagner just used him for a total of five pages and still created a very memorable character. This story ends perfectly. Yup, this series has been fantastic stuff and probably the best of the new Stront so far IMO. Also, considering how Wagner manages to make Stront an ongoing narrative at times, I wouldn't be surprised to see Silverman return in the next story. I thought the same about Silverman - there's got to be mileage in Alpha having to clean up a job he has already claimed the bounty on! I assumed it was early Battle, specifically Johnny Red. I do however have a long history of getting stuff wrong! Homies under der hammer is a great title, and would be a good album title for a funk metal band! Looking at some old Johnny Red captions, they tend to be sans serif, Helvetica maybe, not a serif font like here. Unless there was something else being referenced. I just found it harder work than normal. As much as I'm enjoying the prog- and I am- I really wish that Tharg had put some extra thought into the look for the VR pages. The font chosen wasn't the best and unfortunately Steve's 'open' artwork my not have been the best suited to those scenes. Maybe calling in PJ for those pages would have worked better? Also- remember the 3riller with the old war comics characters that Boo Cook drew? Am I right in remembering that on the flashback pages for that there was an 'aged' look to the borders? That would have suited this section in my opinion. That being said- a superb run of progs- and after talking to Carlos over the weekend that he only finished drawing this strip 2 weeks ago It renders null and void any queries as to any issues on the art. The maestro delivered in a pinch. Pretty sure it's the same typeface used for the captions in Black Shuck - but what Bolt said, I think Gunheads did a much better job of that kind of retro homage. The left will eat itself. ... after talking to Carlos over the weekend (I learned) that he only finished drawing this strip 2 weeks ago ... The maestro delivered in a pinch. Nice cover, although I'm not sure about the text. 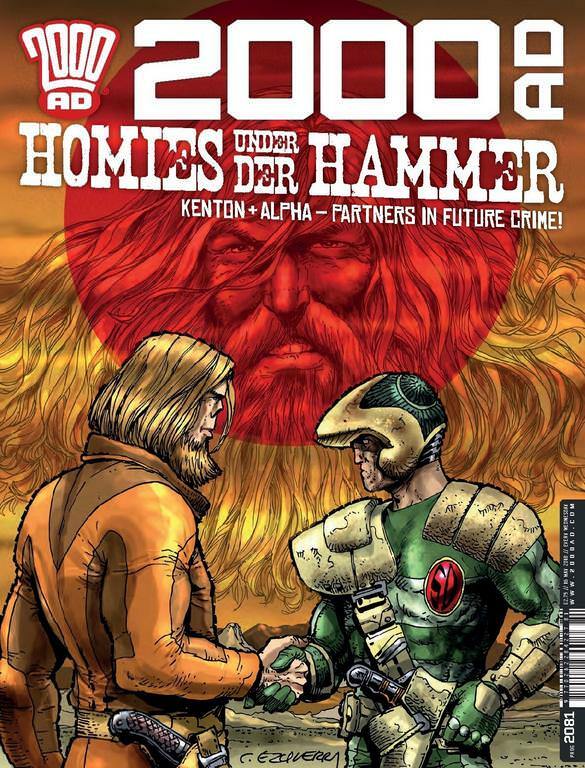 'Partners in future crime'... Strontium Dog's aren't criminals, are they? Even if they do break the rules sometimes. Also the word 'homies' makes me boak, but not to worry. Good wee Dredd. The payoff is fun, for me, but is only going to work for long-term Dredd readers - anyone who hasn't read the Judge Child Quest is going to be left scratching their heads and feeling like they missed something. Dan Cornwell is great and works perfectly with Abigail Bulmer's colours. Shame the two main judges here look almost identical on p.1, but that's a minor niggle. Skip Tracer, too early to say, but it looks lovely (Paul Marshall really is consistently great, and Teague's colours set the mood well). The hero seems a wee bit nondescript but it's only been five pages so far after all! Deadworld... have to agree with Colin here, reminds us what's gone before without being recap heavy, and sets up a mission which I am very excited to see. The horrors awaiting Jess in the city... I shudder to think but can't wait to find out. Kendall's art may have stepped up a notch here too, there a real clarity to the faces. Pick of the prog for me. Stront - This has been a funny old story but has reminded me how great the strip can be when it returns to the central premise. Bounty hunting in a bizarre sci-fi universe. Endless mileage there for different types of stories. More please! And my quote of the prog award goes to Silverman: 'Don't interrupt. I'm working myself into a frenzy'.